What was once unthinkable has been happening on a very large scale: In Russia, streets have been choked by tens of thousands of protesters. From St. Petersburg to Moscow to Vladivostok, Russians have demonstrated against recent parliamentary elections that many people say were rigged in favor of the ruling party, United Russia. The protests are happening in advance of the presidential election in March 2012. Prime Minister Vladimir Putin hopes to be reelected to the presidency, which he held from 2000 to 2008. Putin is a special target of the demonstrations, since he has been seen in Russia and elsewhere as limiting basic rights by harsh methods. Unperturbed by the rallies, Putin denounced the protesters as stooges of the West, claiming that some were paid for demonstrating. He even blamed U.S. Secretary of State Hillary Clinton for inciting the unrest. On a talk show, Putin displayed a disdainful attitude toward the protesters, an attitude that didn’t help his cause. He was widely criticized for being out of touch with middle-class Russians. Now Putin has a new headache—an opponent for the presidency. In a move that stunned Russian and American observers, billionaire Mikhail Prokhorov, owner of the NBA team the New Jersey Nets, announced his intention to run against Putin. Prokhorov made his mountains of money during the privatization of industries once controlled by the Soviet government. His particular fields were metals and finance. But is Prokhorov a genuine candidate? Various observers have proposed that his candidacy is not a serious challenge to Putin, since Putin’s critics are unlikely to rally around such a wealthy man, but is instead a plan to convince the protesters that the government is paying attention to them. The coming months may reveal the truth. 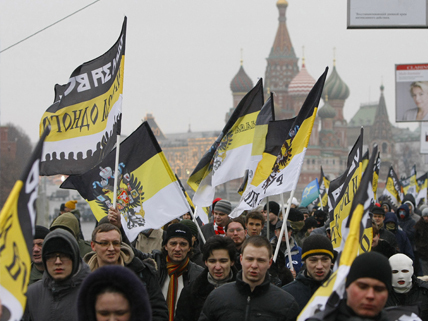 Read about the rallies in various Russian cities. This article in the Boston Globe provides more detail about the protests and Putin’s defiance. In this podcast interview, a Russia scholar proposes that Prokhorov’s campaign may be an attempt to provide a fake opposition. Watch a video about the protests set to music by a Russian rock band. Read about the life and career of Vladimir Putin. Catch up on the Russian billionaire’s background. I think that Putin has his hands full. I think he shouldn’t have blamed Hilary Clinton cause it only added gas to his fire. It really makes you think about what is going on in the world today!